In general, you want to use the biggest Carv Insert that fits, so you get the best pressure coverage across your foot. 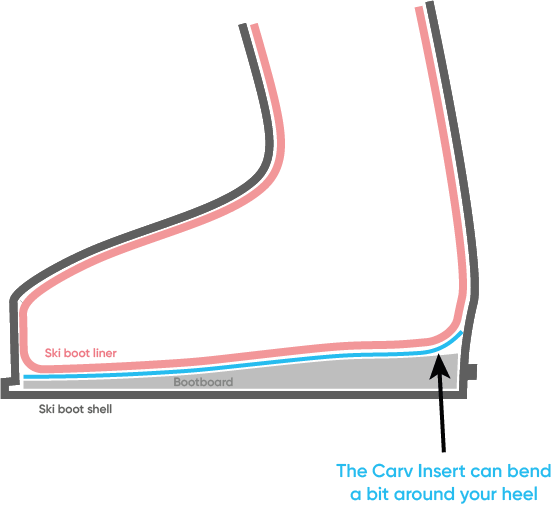 If you use too small an Insert, Carv won't be long enough to sense pressure from both your heel and your toes. We find that some boots are right on the cusp of two Carv sizes, so the Carv Insert can be slotted into the boot, but it doesn't sit flat. In these cases we recommend that you push the Carv Insert as far forwards as possible and allow it to bend a little at the heel. Whilst we've designed the Carv Insert to bend a little (particularly in this heel cup area), if you bend it too much and bend it repeatedly, it will snap. So please use your judgement and if you're concerned, get in touch and we may decide to ship you a smaller size. Generally, the Insert can bend up by 10mm with no problem, though this depends a bit on how sharp the bend is! How do I stick it down?